Every community has leaders who make a difference. Let’s see a work of art of six leaders of the American War of Independence (1775-1783) and Founding Fathers of the United States of America. Do you recognize anyone in this painting? Here we have six leaders of the American War of Independence and Founding Fathers of the United States of America. On the left hand side of the canvas is Alexander Hamilton (1755-1804), who was a statesman, writer on governmental issues and first Secretary of the Treasury. Next we have Benjamin Franklin (1706-1790), who was a statesman and a diplomat, author, scientist and inventor. Next we have Thomas Jefferson (1743-1826), who was a statesman, diplomat, architect, author and 3rd President of the United States. Next we have George Washington (1732-1799), who was a general and the 1st President of the United States. After George Washington, we have James Madison (1751-1836), who was the 4th President of the United States. Lastly, on the right hand side of the canvas we have John Marshall (1755-1835), who was a jurist, statesman and Chief Justice. Explain the need for leaders in communities and describe their roles and responsibilities. Leaders solve problems, resolve conflicts, spur change and work towards progress. What about citizens? What civic responsibilities does a citizen have? A citizen should obey laws, vote, participate in governance, and lend his or her expertise to help others. Events and ideas spur change. For example, the ideals of the American War of Independence (1775-1783) initiated a change in government. What are some of the basic documents that leaders in early America wrote that initiated a change in government? The Declaration of Independence is one such document. The Constitution and the Bill of Rights are two others. What important idea was formed by these documents? These documents formed the foundation of constitutional government. What are the Constitution and the Bill of Rights? The Constitution is the supreme law of the United States. It sets out the relationship of the federal government with the states, citizens and all people within the country. It creates the three branches of the national government. What are the three branches of national government? There is a legislative branch with two chambers including a House of Representatives and a Senate, there is an executive branch led by the President, and there is a judicial branch headed by the Supreme Court. What is the Bill of Rights? The Bill of Rights is the name for the first ten amendments of the Constitution, which limit the power of the United States federal government. The Bill of Rights protect the natural rights of liberty and property. Not only are there leaders in government, there are leaders in science and technology as well. Name some inventions and discoveries that have spurred change. Specifically, how have inventions and discoveries made communities more productive and interdependent, and how have they changed the way people live? One leader in the field of science and technology is Alexander Graham Bell. In 1876 he received the United States patent for the telephone, which would connect communities across vast distances. Another leader is Thomas Edison. In 1879 he invented a carbon filament in a light bulb that improved on a fifty-year-old idea, which allowed light to be generated for many hours and at a cost that was affordable for the average household. The light bulb would improve economies and would greatly change how people live. Two important inventors that I am sure you have heard of are Orville and Wilbur Wright. It is generally held that in 1903 these brothers were the first to fly and sustain in the air a manned, engine-powered, heavier-than-air plane. Airplanes would change the way people live. They would connect communities across vast distances and would make communities more interdependent. Another important scientific leader was Alexander Fleming. In 1928 he discovered the penicillin antibiotic agent that would cure men of infections and greatly improve lives. Look closely at the many details in this painting. Is there anything unusual about the figure of Benjamin Franklin? Do you see a glowing color around his body? According to lore, Franklin tried to prove lightening was a form of electricity when he flew a kite in a storm and extracted sparks from a cloud. The artist was clever about painting the color blue around the figure of Benjamin Franklin to represent electricity. What do these figures stand for? They stand for equality for all, American independence, and the ideals of a government by the people for the people based on individual liberty. Look carefully. What else do you see? There are turquoise stripes and a design of star-like sumac plants. Count the number of plants. How many are there? There are thirteen. Perhaps the star-like sumac plants represent the original thirteen colonies in America. How do the parts come together? With a little imagination, the parts come together to form what looks like stars and stripes of an American flag. The artist seems to be suggesting something about the United States. What do you think our Founding Fathers would say if they came back to America today? Would they be happy? Unhappy? What makes you say that? Are the ideals, which the Founding Fathers stand for at risk? What clues in the work show this? 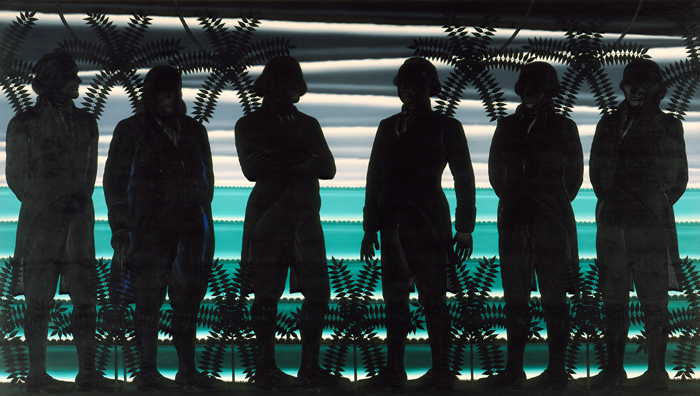 Is it by the fact that the figures are silhouetted and are standing on a dark stage show this? Or perhaps the leaders would be pleased by how our nation has progressed. Perhaps they would be pleased we have created programs to protect the weak and poor and sick. And what about our advances in medicine, new types of technology and large population growth? Would such things amaze the Founding Fathers? What do you think? Here we have a portrait of George Washington (1732-1799), who was commander-in-chief of the Continental Army of the American War of Independence and 1st President of the United States of America. Many think Washington looks dignified and stately in his blue regimental coat. What do you think? 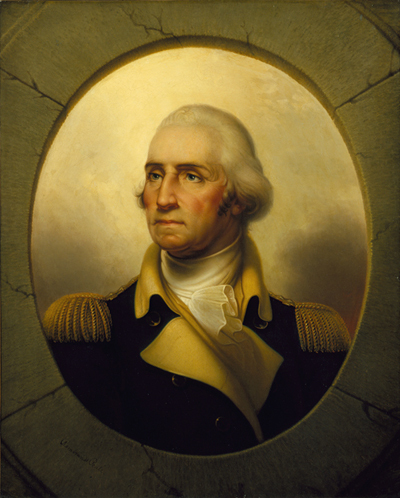 Has the artist portrayed Washington as a powerful leader who could solve problems, resolve conflicts, spur change, and work towards progress? How so? Look at the expression on his face, especially around his eyes. Does he look determined? Strong? Confident? According to historians, Washington was a man who made others feel confident in their abilities and pride and joy in serving under his command. Do leaders need to possess such gifts? Think about this for a moment. Would you like to see American Landscape with Revolutionary Heroes and George Washington in person? All you have to do is visit the North Carolina Museum of Art in Raleigh, North Carolina. American Landscape with Revolutionary Heroes and George Washington are in the American galleries at the museum. Or perhaps you would like a tour. Tours of the collection are given daily, except for Monday when the museum is closed to the public. If you prefer, you can contact the museum ahead of time and arrange for you and your friends to have a private tour. I’m sure a docent at the museum would be happy to show you and your friends American Landscape with Revolutionary Heroes and George Washington and many other works of art. Whether you visit the museum on your own or have a tour with a docent, it will be well worth your time!